Segments of tonight’s painting. A work in progress. Another deconstructed landscape under construction. The Freedom series continues. Small works on paper, approached with experimentation. A way to loosen up painting and art.This piece is one of the wettest pieces I have made in recent weeks. Layers of diluted ink veiling one over the other. Hard lines for contrast. This piece is based on recent spring floods, and the spreading flowing waters. There is inspiration everywhere. 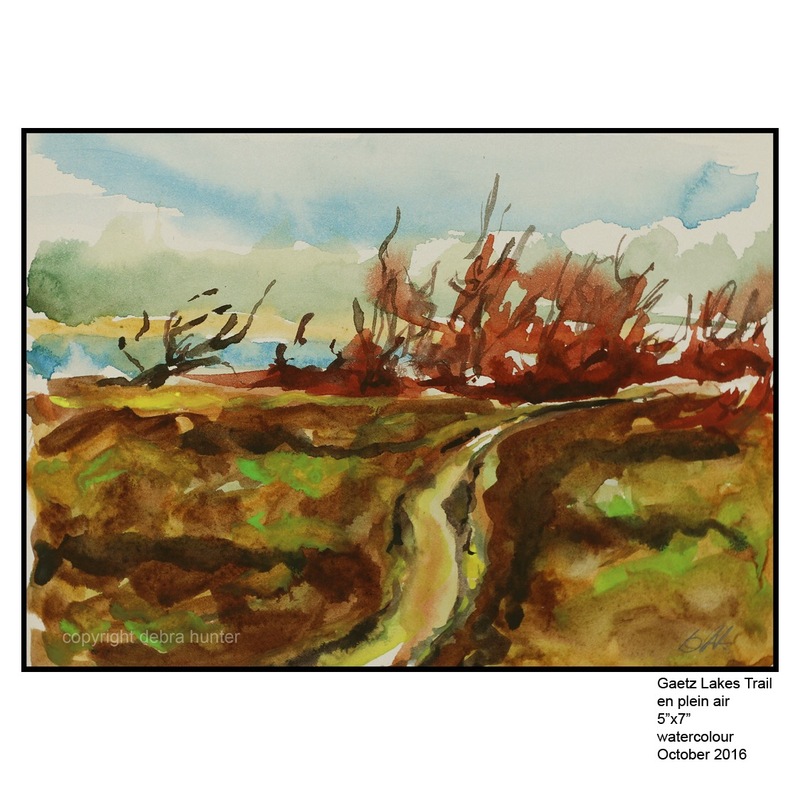 And so the paint meanders……. A new work in progress. An idea that has shifted a dozen times in the last few days. In the last couple of hours it has found its path. I think we have navigated past twee and into stronger territory. A smaller canvas at 16″x20″. I wanted to test out playing both vertical and horizontal lines on something smaller, testing to make sure it didn’t get too landscapey, but was still reminiscent. Hopefully I will be up to the strong color portion tomorrow, that is when we will see if it all comes together. The Freedom Series is an ongoing group of pieces started in 2018. I had wanted to work on an ongoing project that had few limitations in an effort to avoid “painters block”. By choosing the word “freedom”, it allowed me to approach the paintings with just that, freedom. It could be abstract, landscape, or based on any other inspiration. The only real limitation is that I have chosen to work on paper. This decision was made as I feel you are more likely to produce more work, and take more risks, and experiment more when working on paper instead of canvas or board. The pieces, to this point, are an extension of the paintings I am currently doing on canvas. soft and hard lines, fields of color, lots of meshing color, and a nod to landscape. Some are also proving to be studies for larger pieces. Several weeks in to this project, it is proving to be quite interesting, and quite beneficial, as it is very conducive to promoting a daily practice. En plein art painting is always an interesting experience. You are dealing with shifting light, unpredictable conditions plus distractions. 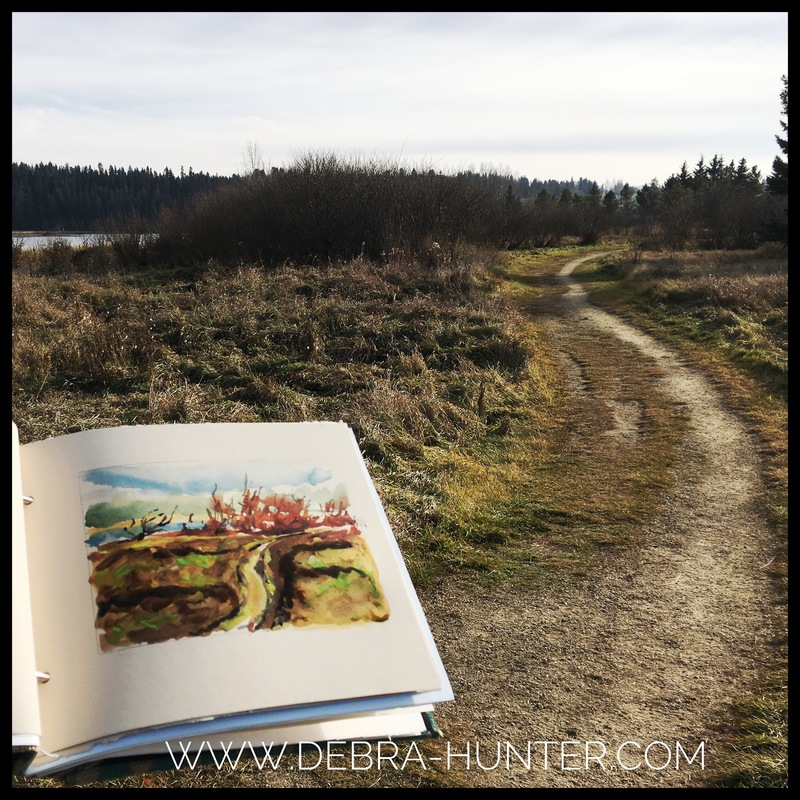 The great thing about working en plein air is how it teaches you to see and break down a scene so that it can be rendered on paper or canvas. It has been quite a while since I have painted en plein air landscapes, but the last few days provided great opportunities. 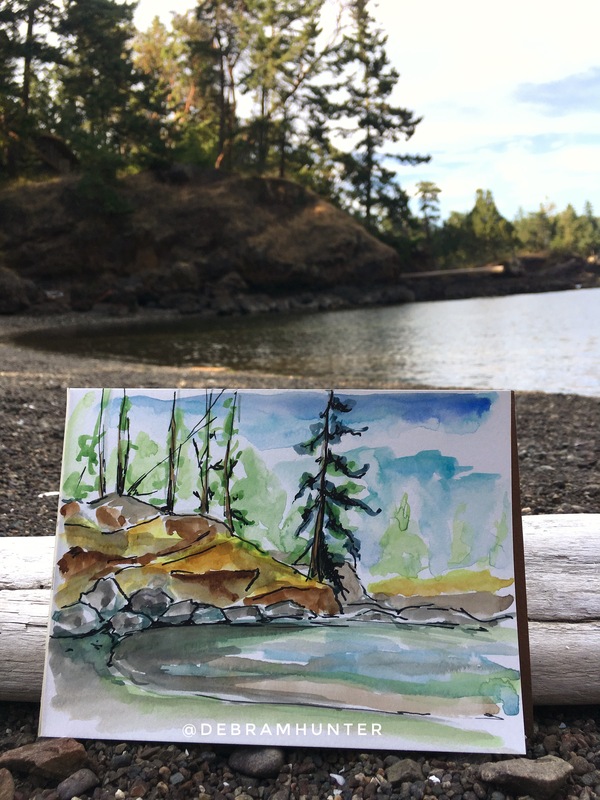 The beaches of Pender Island have been beautiful places to sit and paint. Being a minimalist at heart, I have made a few changes to the art equipment used for outdoor painting. The art kit has now been stripped down to a watercolour pad, a waterbrush, a small travel watercolour paint kit, and a fountain pen. So streamlined. Less is definitely proving to be best, allowing me to focus on the painting rather than on an overwhelming array of art materials. A quick afternoon watercolour painted en plein air at the Gaetz Lakes Sanctuary, in Red Deer, Alberta (Canada). I was recently going through a few paintings from spring of 2016. During that time I was taking a theme and then doing a few paintings based on a single theme before moving to a new subject matter. I thought it would be interesting to do a post showing a few paintings based on a single location. These paintings are all from Johnson Lake which is located in Banff National Park (Alberta, Canada). This first painting is from the viewpoint looking back on the trail that skirts the lake. This is a lovely spot for walking with clear views and the warm sun often bounces off the slope. This view of Johnson Lake is one of the first scenes one sees when they approach the lake from the parking area. In the background we have the beautiful mountains of Banff National Park, while the foreground displays the sandy beach and blue green water, a color associated with many lakes and rivers that run through the Rockies. The location in which one sees this view is a perfect place for a picnic. In painting this work, I wanted to explore the interesting shape of the tree while highlighting the amazing color of the lake. This angle is from the far end of Johnson Lake. This painting has a slightly different paint treatment than the other paintings shown. The other paintings are painted in a flat and matte style, while this painting employs textures and glazes with a hint of gloss in the sky and tree. I think it is quite interesting to add this texture to a work on paper. This final Johnson Lake painting again focuses on a tree in the foreground, a tree located at the far end of the lake. I will admit I really enjoy painting trees, especially trees that have yet to leaf out. This painting takes a slightly looser approach as I felt the tree and the blues in the background did not need competition from further detail. It is one of those paintings that reached a point and just felt right, I loved the blues, I loved the movement in the branches, and I knew it was time to put down the brush. It is always interesting when you start to paint a single area in multiple paintings. I have done this with a few different spots including one area in the Gulf Islands where I have based many paintings. I find the more times you visit a spot the more your paintings evolve, and the more you paint the location the more you enjoy future visits. Painting and hiking are great mates, once you know scenery could become future inspiration for your art, you start to really “see” the landscape you are viewing. Another en plein air painting, 8 paintings in 8 days. After yesterday’s rushed watercolour I returned to oils today. The oils were tackier in the sun, harder to move around, but they do seem to suit en plein air painting where your time is limited and it is more of a gesture rather than a detailed painting. Of course I believe the concept of doing a painting a day is more about process than product; away of learning how to make yourself paint rather than waiting for the perfect scenario and inspiration. Day 7 of en plein air painting brought a challenge. 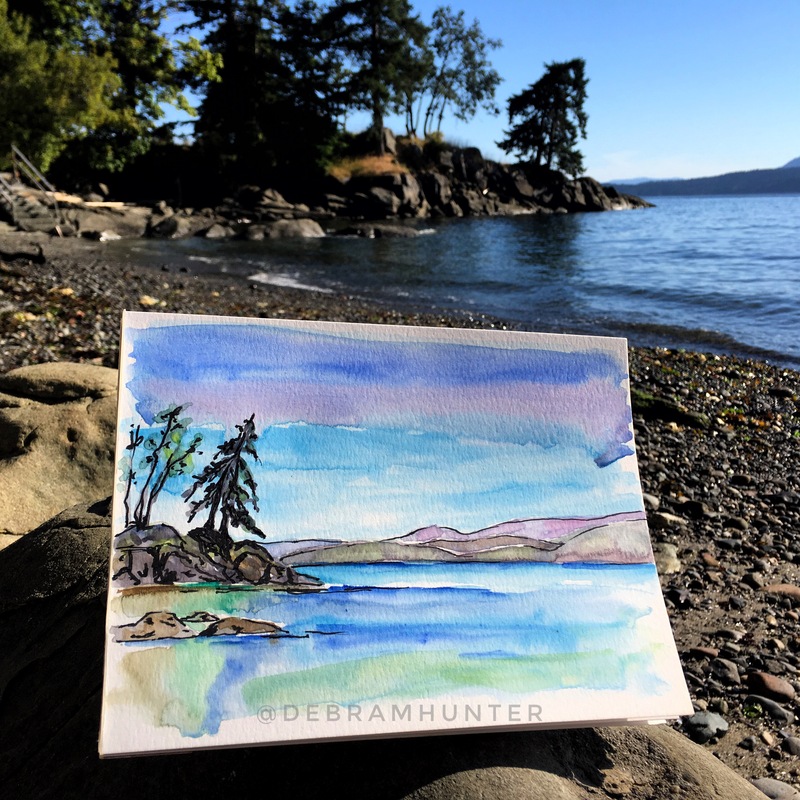 We decided to go out of town hiking, so the only way to keep up the daily painting was to pack up the watercolours for a quick paint post hike. Another little one, 5″x7″, watercolour on paper.